It is always exciting to fly abroad, but with excitement comes a lot of trouble of booking your flight ticket. Now, fly from the city of dreams, Mumbai to the dream city itself, London, only on the best Mumbai to London flights. To ensure you have a seamless booking experience, akbartravels.com brings you a fast and a convenient way to book your Mumbai to London flight online. With information like which airline operates at what time to how many flights depart in a day to your travel destination. We provide you all the information required to book Mumbai to London flights. It’s time to pass on all your worries to us, just book your Mumbai to London flight online and enjoy a hassle-free journey. Looking for cheap Mumbai to London flight tickets? Now you can search and book Mumbai to London flight tickets on www.akbartravels.com. Akbar Travels makes it easier to book flight tickets by giving you access to a range of tools like Mumbai to London flights schedule and Mumbai to London Airfare Calendar. Apart from this, Akbar Travels price alert feature ensures you get the cheapest fare for Mumbai to London flight ticket every single time! Whether you are booking a one-way flight ticket from Mumbai to London or a return ticket, you can rest assured on getting the best deals and offers on Mumbai to London flight tickets. Booking Mumbai to London flight ticket online gives you several benefits like insurance, 24/7 customer support, reward points and access to multiple airlines. Akbar Travels offers you the widest choice of airlines for Mumbai to London flights. So you can choose your most preferred day, time and number of stops for your flight. So why wait? Book the best deals and offers on flights from Mumbai to London only on www.akbartravels.com today! Flight Tickets (onward and return). Previously known as Bombay, Mumbai is appropriately nicknamed as “the city that never sleeps”! It is the financial capital and the largest city in India. Formed by connecting seven islands on the Konkan coast, Mumbai is an eclectic and cosmopolitan city which is often associated with glitz and glamour. South Mumbai is the main tourist hotspot as it is home to several art galleries, restaurants, clubs, museums, bars, and the famed Gateway of India. The area also houses several designer boutiques like Chanel, Dior, Armani, Hermes, and Zegna. The top sightseeing spots in Mumbai are Gateway of India, Juhu Beach, Colaba Market, Siddhivinayak temple, Sanjay Gandhi National Park, Haji Ali Dargah and many more. 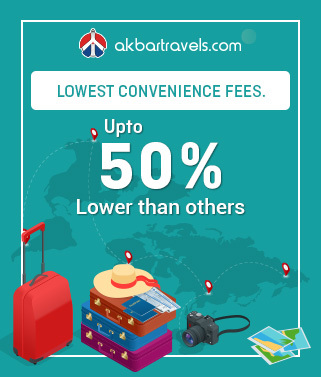 Find the best deals on Mumbai to London flight tickets on www.akbartravels.com and book your flights at the lowest airfare along with benefits like instant confirmation, airfare calendar, easy cancellation/refund and lowest convenience fee. Chhatrapati Shivaji International Airport Domestic Terminal, Terminal -1B (Santa Cruz), Mumbai - 400 099. International Airport - Sahar Road, Andheri East, Mumbai - 400099, Next to JW Marriott Mumbai Sahar (Map) International Airport, Airport. London is an unbelievable city which is a fabulous host to visitors. Absorbed in history, London is brimming with art and culture. No matter what you are concerned in, there will be something for you in the capital city of England which is also regarded as one of the most important cities in the world. In fact, you may find the hardest part in deciding what to see and what to miss out in London. From getting up close and personal with the underwater creatures at SEA LIFE London aquarium and exploring the Science Museum to visiting the Queen at Buckingham Palace, or taking the perfect picture with Big Ben; there are many iconic places to go in London. Many of London’s other top attractions such as Trafalgar Square, the National Gallery, Piccadilly Circus, Leicester Square, Buckingham Palace and St. James’s Park also lies at a very short distance. The best time to fly to London is in the months of March to May when the temperatures are mild and the city's parks are green and blossoming. However, late spring along with summer is also a prime season. You're more likely to find airfare and lodging deals in the fall and winter though you'll also encounter chilly temperatures. December in London is also an extremely popular place to be during the breaks, so expect the streets to be packed with both English and international visitors. London is well-connected to the rest of the world by air with daily flights working to and from hundreds of destinations. It is served by 5 airports with Heathrow, Gatwick and Stansted being the most significant ones. About 100 international airlines run flights in and out of London Heathrow Airport. Airlines that fly directly to London from India are Virgin Atlantic, Air India, British Airways and Jet Airways. UK’s outstanding road network links London to other cities in the country. The roads makes for a fantastic drive and you can catch sights of the beautiful English countryside. Bus services to several destinations operate to and from London are available at the Victoria Coach Station and other stations. Commuting by bus is a popular option specifically for budget travellers. Being the center of the British Rail Network, London is served by regular train services from other cities in the country. London is also well-connected by rail to other cities in Europe such as Berlin, Paris, Brussels, and Amsterdam. The Eurostar high-speed railway service links London to Paris and Brussels and operates from the St. Pancras International Station. Enticing 27 million tourists every year, London is the most visited city in Europe. It’s no surprise that the city tops so many people’s travel plans. With some of the world’s best art, shopping, dining, entertainment and history, one will never get bored in London. From iconic London tourist attractions to unusual ideas for your days out, our city checklist will help you find something new. 1.Which months have the lowest fare for Mumbai to London flights? December is the month with the lowest fare for Mumbai to London flights. 2.What is the best month to travel to London by Mumbai to London flight? The best month to travel to London is from May to September. The distance from London Heathrow airport to the centre of London is around 27 km. 4. How to travel to the city centre from the airport? The city centre is connected to the airport via taxis, shuttle trains and buses. 5.What is the currency of London and its approximate conversion rate? The currency used in London is Pound Sterling. 1 Pound is approximately valued at 96.87 INR. You can check the currency conversion centres for more details. 6.What is the time difference between Mumbai and London? The time difference between Mumbai and London is 4 hours 30 min. 1.What are the top airlines that operate from Mumbai to London flight route? 2.At what time does the first flight leave from Mumbai to London? The first flight from Mumbai to London is Jet Airways at 01:45 AM. 3.When does the last flight leave from Mumbai to London? 4. What are the airport codes of Mumbai and London? Airport code of Mumbai is BOM and London is LHR. 5.What is the name of the airport in Mumbai? 6. What is the name of the airport in London? The name of the airport in London is Heathrow Airport. Over 300 languages are spoken in London: Being one of the most diverse cities in the world, London houses over 8 million people who speaks different languages. Black cab drivers test: Becoming a black cab driver is not easy in London. To become a cab driver one has to go through a rigorous test called ‘The Knowledge’, which involves memorizing all the street names in the capital. The preparation for this test takes around 2 to 4 years. Big Ben is actually not Big Ben: The very famous landmark, the Big Ben is actually not Big Ben, but ‘the Clock Tower’, the Big Ben is the name of the bell.